Expedition is just what the name suggests. You take an expedition into the unknown! 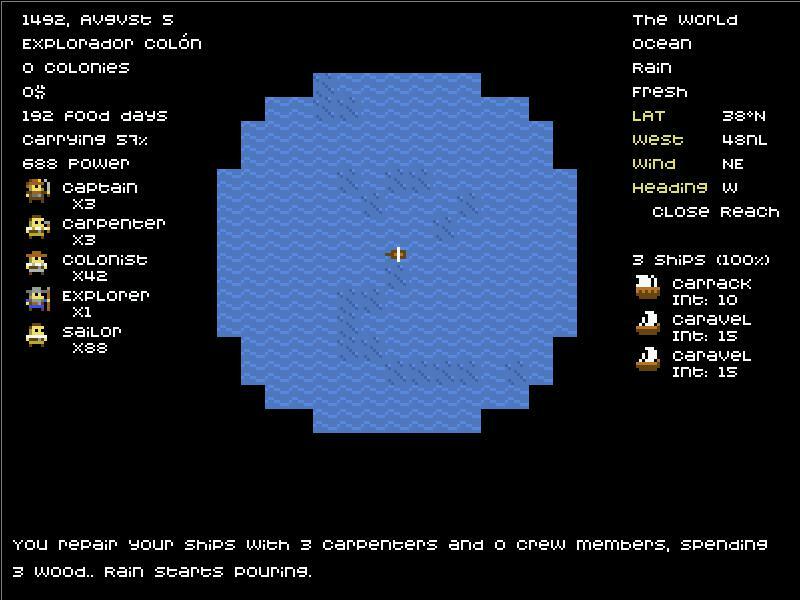 Find unclaimed land, found a colony there and sail back to impress the royalty of Spain and get rich. After being granted an audience in Alcazar of Segovia you start with two caravels, one carrack plus a bunch of sailors led by three captains. Make good use of 6000 maravedies you have. To establish a town you need to drop off one hundred people there and build a plaza. So take some colonists along. They are cheap but keep in mind they need to eat too. One thing to note is controlling your expedition is not exactly straightforward. Left arrow will turn to portboard and right arrow will turn to starboard. Repeatedly pressing left arrow will not get you to America (*cough! * I mean Asia); you will sail in circles instead. Ships have hull integrity points. Hazards like storms and reefs damage them. If a ship loses all integrity points it sinks possibly forcing you to forsake some cargo. Damaged ships sail slower so it is imperative to keep them in good condition. To make repairs you need free men and logs of wood. Take at least one carpenter with you. Two hundred logs should be enough to make it one way. Devastate some forest to get enough wood to get back safely. Game is prone to sudden crashes. A rare event but even a hurricane is not as dangerous to your progress. On the good side Expedition has three interface modes to choose from. Java curses based, libjcsi based and graphical. Expedition has fitting music. Just listen to it while sailing to new lands. Playing the game may seem easy but avoiding storms and trying to not let your crew starve at the same time is bound to cause troubles. May the winds favor you! I’m guessing that this is the same Expedition that was released as a 7DRL sometime, maybe last year? Or its child? Sounds intriguing regardless! One question, though. Where’s the link? That sounds awesome. Good setting, I will try it! Pretty interesting, there’s a download available at http://slashie.net/page.php?27 as it’s not mentioned in the article. I hope they keep working on it, it looks like it has a lot of potential. Thanks Sylverone and TheTrav. I fixed the omission. Expedition indeed has grown from a 7DRL. It is not first game by Slash that was born like that. Remember Castlevania: Prelude? It is no sign of being underdeveloped. work on. You have done an impressive task and our whole community shall be thankful to you.